This was number 12 in my upcycled blues series of tops. I made it over a series of weekends as I was trying to use up leftovers from the previous tops - so you will see various partial blocks and smaller crumb type blocks if you could see it up close. I sewed a lot of small things onto adding machine or cash register machine tape - and then framed them with 1.5" strips of darker blue fabrics. I haven't written up a pattern for this, because I talked about how I made it over the course of the blog posts. If you want to go back and read them, you can find them - just do a search for "All Crumbled Up" and read them. Someday I'd like to write up how I made each of my crumbs quilts, but for now, it's just going on eventual "to do" list. I've got too many other irons in the fire, so to speak that are priority. We just got a new load of snow -well, load is a bit of an exaggeration. Maybe it was 2". Some places were deeper where it drifted a bit. Here's the backing - a pieced hodgepodge. I was trying to use up the blues I had - and threw in some of the tans - and I even used leftovers from other backings (the far right strip). I quilted it with non evenly spaced more or less straight lines - using the quilt itself as a guide for where to quilt. I tried to quilt relatively closely since I DID NOT TAKE THE PAPER OFF FIRST. I know, I know, it might be an issue for me, but so far it hasn't been. I have been warned, so I will be prepared to be disappointed if it develops little lumps where the paper wads up. I may wash it one more time when it gets warmer and even put it in the dryer, something I don't normally do - just to see what happens with the paper. So far it has hardly left its position - though I do think some of it must have sort of dissolved. In other places I can still feel it. I have a front loader washing machine - a smallish (by USA standards) machine that barely holds these large quilts. I kind of shove them in hard, close the door and hold my breath that the machine will "latch". They don't actually have much room to swish all around as a large machine with an agitator would. I had a hard time getting a "flat" picture because of the wind. I grabbed what pictures I could and came back inside. Those of you who live in truly "bitterly cold" places can laugh at me - but I think I've become a wimp. We've had 2 or 3 very mild winters lately here in Poland and I've kind of gotten used to them! 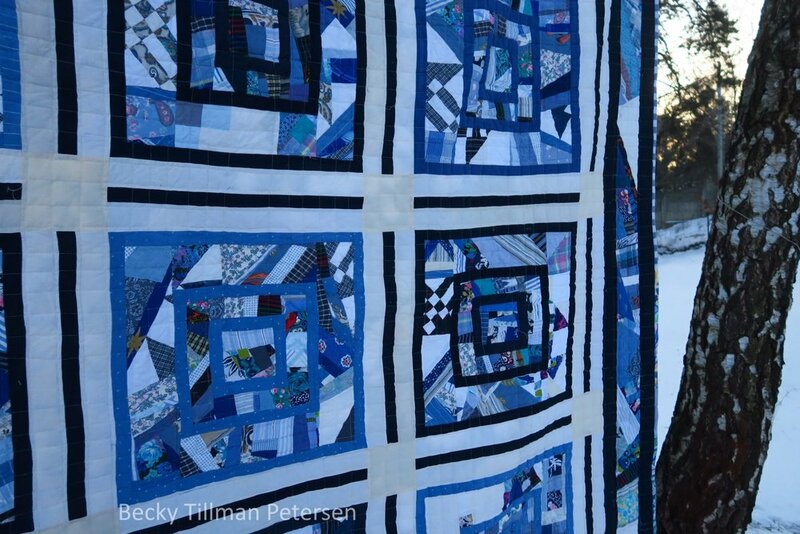 When you look at this quilt, all the crumbs parts were sewn on paper except for the centers of each of these blocks. This includes the border. It was very cold when I was trying to get a picture of this - and the wind was blowing - a lot. I left it on the line for a couple of hours waiting for the wind to die down. I had to go see a lady and help her for an hour and a half or so so I just left it there while I was gone - hoping no one would steal it and also hoping that the wind would die down by the time I came back! I was trying to sneak another set of pictures in before it got too dark. Obviously no one stole it, and the wind died down only marginally. And that's what's been happening from my part of the world!